Latest update: 22 Jun 2016. Version: 4.7.3. 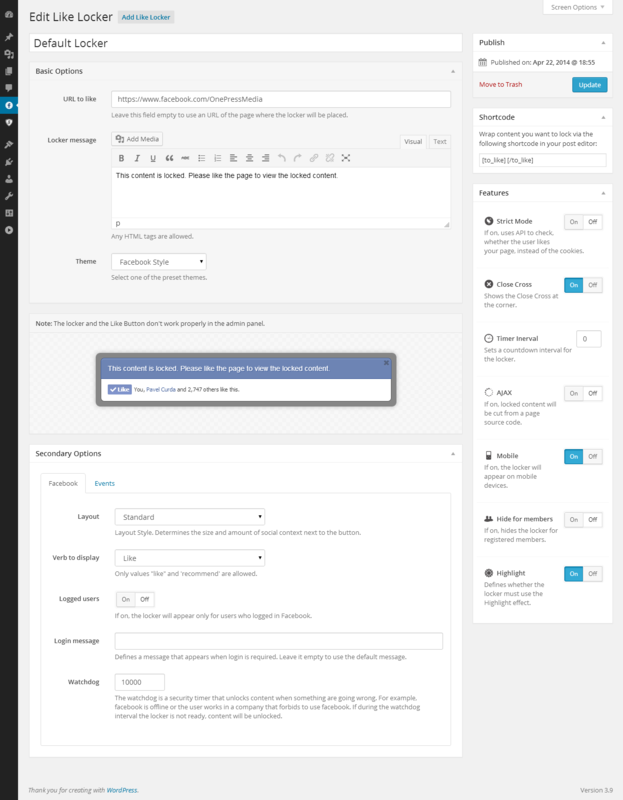 Platform: for Wordpress. Why Does The Like Button Not work On Your Website In Fact? You use a standart Like Button on your site but people don’t click the one as often as you would like? Needless to say, a Like button is a very powerful tool that can help you to drive more social traffic, fans and customers. It should be, but usually it is not. Even if people like your content, site or fanpage, they don’t click a Like Button because they don’t worry about you, your benefits or your traffic. It’s not their problem. Just Ask People To “Pay” With A Like! Giva A Reason! Use the Like 2 Unlock plugin to lock discounts, videos, download links, images, bonus content, forms and more until a user clicks the Like Button. It’s honest and natural way to increase the number of likes, to get additional traffic and more customers from the social network. Info about user’s Like is posted in Facebook immediately on the wall, in the Activity Feed and in the Ticker of him friends! Note: You may continue to use Like buttons or other social buttons on your site as you used them earlier. The plugin will work perfect without any problems. Looking for a jQuery version? Click here. IMPROVED: Compatibility with Wordpress 4.5+. UPDATED:The Strict Mode removed as obsolete. IMPROVED: Added the the link to the article on how to fix the error: “The following permissions have not been approved for use and are not being shown to people using your app: user_likes”. IMPROVED: Compatibility with WP 3.8 and WP 3.9. FIXED: A lot of bugs. WARNING! If you get an error while trying to download the update, please reinstall the plugin by using the latest archive from CodeCanyon (v.4.7.0+). FIXED: The layout error that appears after the recent Facebook update. Note: Please update your lockers to fix the bug totally (open the locker editor for shortcodes you’re using and click the Update button at the right-top corner). FIXED: A minor bug of incorrect version titles. FIXED: A bug when the locker with the Ajax option enabled returns “0” instead of content. NEW: Ready for Internationalization and localization. NEW: Translated to Russian language. Thanks to Alex Kovalev. NEW: Increased reliability against the conflicts with other plugins. The plugin has been moved on another program platform. The functionality of the plugin is still the same. But the new platform allows to provides some linked services such as auto updates, a usage of the plugin during a trial period and others that will be announced in the future. Please note: it requires submitting a license key to get started to use the plugin after installation. NEW: An ability to hide the locker for registered member. NEW: A debug option on the setting page to show the locker always even the one was unlocked. The bug of WordPress permissions was fixed. Support of mobile devices improved (including touch screens). The preset themes were made fully responsive.